Two members of the court security team at the Worcester court complex helped save an elderly Fitchburg man who was stricken Wednesday morning, January 7, 2015 at the Worcester Trial Court. According to this item in the Worcester Telegram and Gazette, the man had stopped breathing and did not appear to have a pulse. Associate Court Officer Kimberly Fluerant performed chest compressions on the man while Court Officer Joseph Cappabianca and Sgt. Michael Sonia of the Massachusetts State Police applied the automated external defibrillator. Within a minute of being treated with the defibrillator, the man was said to have been alert and speaking with his rescuers. 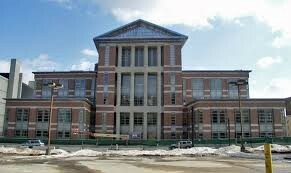 The Worcester Trial Court complex, where two court security officers revived a man during a medical crisis on January 7, 2015.